Early photo courtesy K Meyer, taken by his father-in-law, Charles Wiseheart, ex Mgr Nowra. 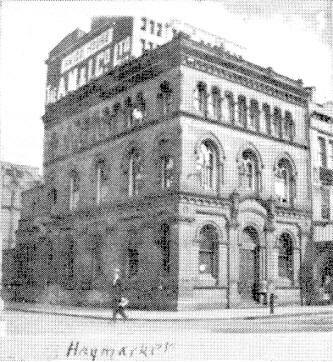 Later to be known as Haymarket branch. 2006 photo of later branch (opposite Haymarket Library, now Bank of China) by John Beer. 1974 1957 Established above Broadway branch. Set up initially at 11 Broadway under management of Mr RG (Bob Taylor) who supervised moving to adjacent to Kings Cross branch. 1958 Transferred to Kings Cross. Front row: Annette Sneesby (West Wyalong), Rosemary Kerr (Broadway), Mr. Street (teacher), Cathy McDonald (City Tatts), Heather Wigby (Manly). She also sent in a newpaper clipping from the Maitland Mercury, March, 1971 re her appointment as one of the first female tellers. 1977 Due to outgrowing the available space, Kings Cross Training Centre was closed in December, 1976. 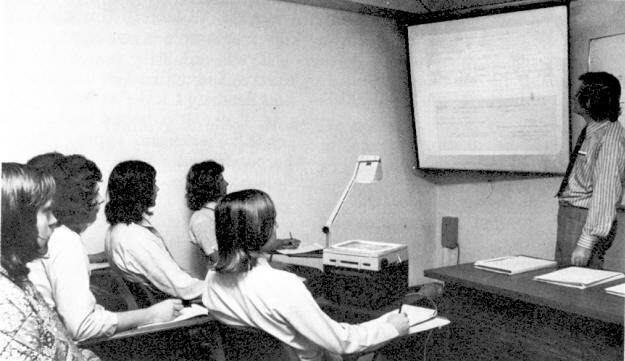 See also Training and Recruitment Centre for N.S.W (below). 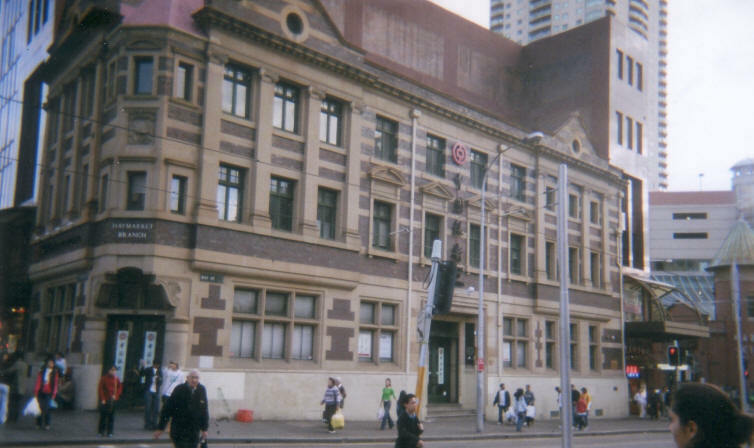 2008 CBC branch was in the grey building 103-105 Pitt Street at left of photo by John Beer, with a laneway between it and the NBA on the corner. 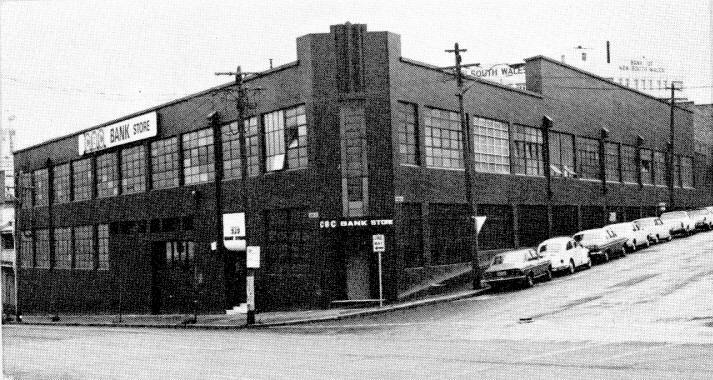 This branch would have been amalgamated into the NBA which is now the NAB on the corner of Pitt & Hunter Streets in the front of the photo. 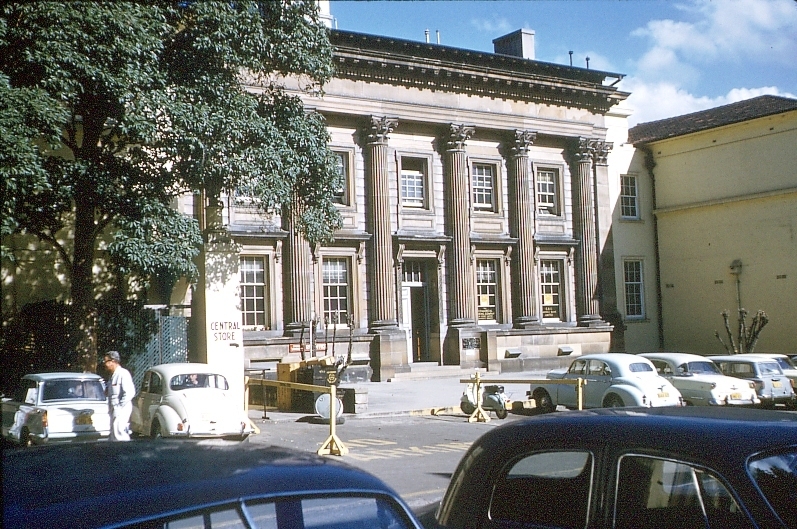 Replacement to 35 Macquarie Street Store and garage in 1975. 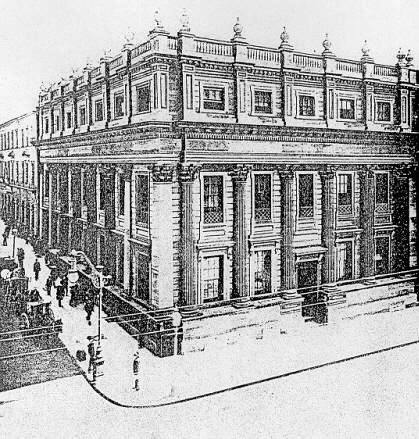 1982 Pictured is the old Head Office building after extensions in 1866, the facade of which became the front of the branch. Hilley designed the original 343 George Street Sydney C.B.C. Bank building built in the 1850s and now at Sydney University. "At the request of Professor Leslie Wilkinson (Australia's 1st Professor of Architecture & Dean of the Faculty at Sydney Uni) CBCofS donated the original facade to Sydney Uni to provide additional accommodation for the Chemistry Department & to serve as an illustration of Gothic architecture. 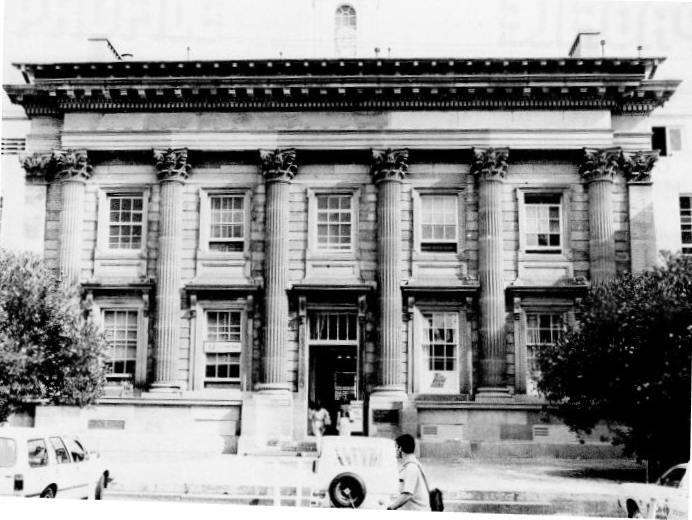 1938-07-11 CBCofS opened a campus branch in front portion of "Bank Building". 1965 approx photo by Bob Handel. 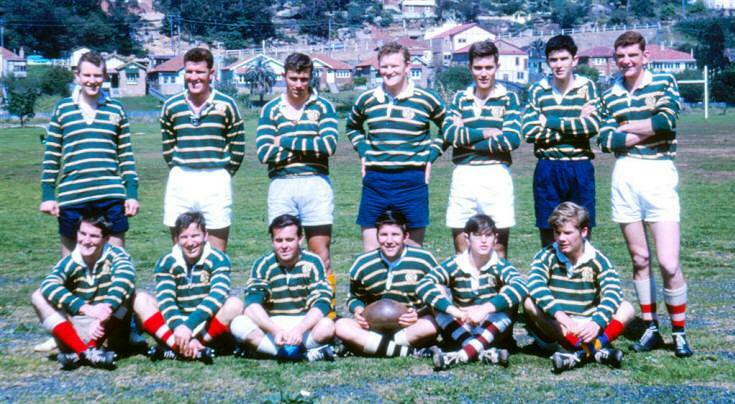 1965 September: The named chaps in this photo were members of Staff at Sydney University Branch (except Tom Byrne) to play a friendly game against staff of the University, somewhere in Marrickville. Pictures scanned from slides provided by Dave Shaw in 2009.
front row Bill Peel, unknown, Neville Howell, Doug Tait, unknown, unknown. 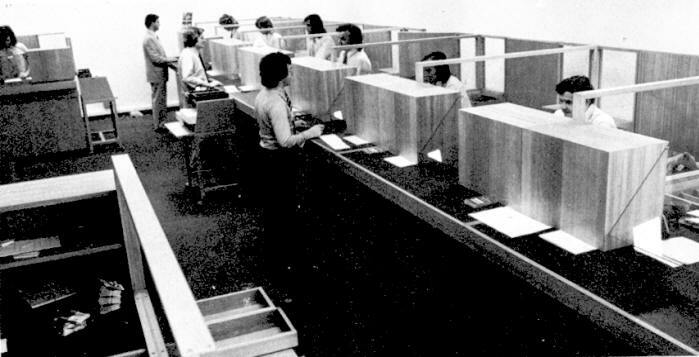 1975 Travel Department commenced (from Current Accounts January 1977). 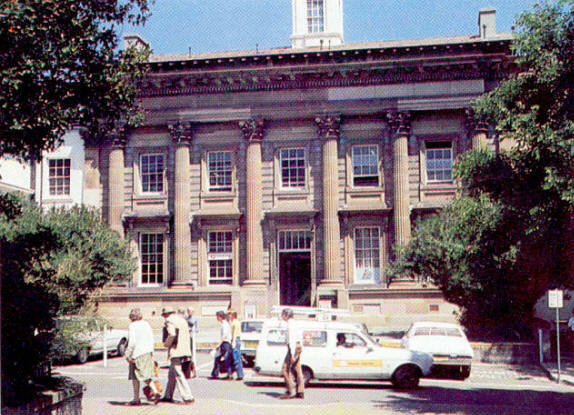 1982 Colour photo from NAB staff brochure "Building a better bank ..."
2009 July John Beer advised "No sign of any branch in 'Bank Building' Science Rd Sydney University. Wentworth Building 3rd Floor contains nab where Teller said the current Sydey University nab branch transferred from Science Rd 'Bank Building'." 2014 August Mike Hook advised: The façade was placed on the front & side of The Pharmacy Building, Science Rd. Where the Bank operated for decades until NAB closed ( one of our most prestigous branches) in about 2000. The Univerity was the oldest continuous customer the combined Bank had,,,since 1854. Hopefully they retained the connection & can service the University , staff & students thru Wentworth Building Branch. Manning House Agency In the early 1960s an agency of Sydney University branch was operated in a corner of the Womens' Union cafeteria. John Ness used to operate a lunchtime service there. One had to go beside the ladies change rooms to access a phone in order to contact the branch.